Fire in Hildale burns 1 structure, large quantity of hay; accident or vandalism? ST. GEORGE — A fire that started in a stack of hay bales in Hildale Friday evening is one of a series of recent fires that appeared to be suspicious in nature, leaving police and emergency responders to believe the fires were not an accident. Shortly after 8 p.m., a fire was reported near a large shed in the 100 block of Oak Street in Hildale. Once on scene, responders found an active blaze burning through a large stack of baled hay, Hildale/Colorado City Fire Chief Kevin Barlow said. The fire spread to the roof of a shed containing several dozen large bales, Barlow said, and once the flames spread over the top of the structure, it quickly became fully involved. Firefighters worked to contain the blaze and keep it from spreading to several nearby structures located less than 50 feet away as the flames continued to burn through dozens of bales inside the shed. Fire crews were also focused on preventing the fire from spreading to a large pile of tires near the shed. Firemen called in a loader to remove the roof from the storage structure, allowing access to the inferno burning inside. With the roof removed, firefighters were able to extinguish the blaze a short time later. “The fire didn’t make it to the tires,” Barlow said, adding that the loader expedited their ability to put out the fire. With the active flames extinguished, crews remained on scene for more than two hours knocking down embers and putting out hot spots to reduce the risk of it smoldering and reigniting later. Early Saturday morning, fire crews returned to the scene after the fire flared up again, as Barlow said he knew it would, and with the help of the rain, were able to extinguish what was left of the blaze fairly quickly. 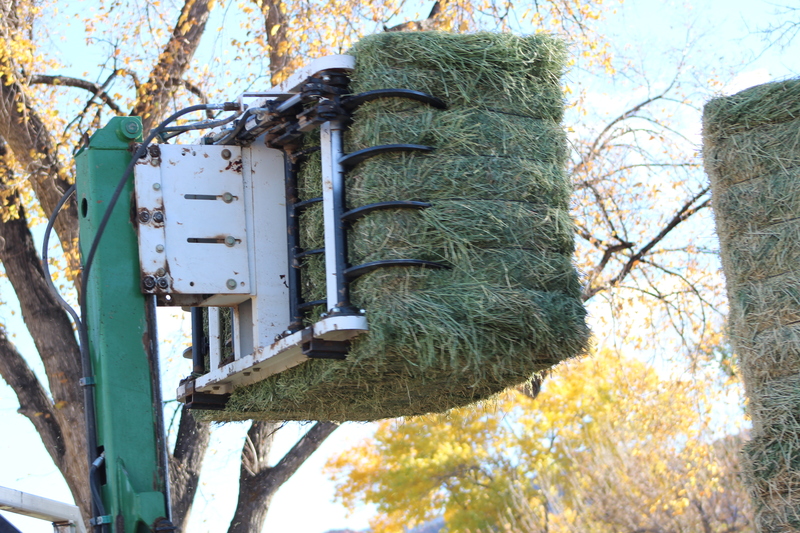 Under the right conditions, hay can produce enough interior heat to ignite on its own, due to the heat that is generated from a chemical process that elevates the temperature of the hay after it is baled, usually occurring within six weeks of being baled, according to Montana State University. Even so, the fire department has responded to several suspicious fires within the last month or so, Barlow said, leading authorities to believe the fires could be connected. The Colorado City Marshal’s Office has become involved, and police have reason to believe that the recent fires were possibly set intentionally, possibly as an act of vandalism. “We don’t really have a lot of leads yet, but we are working closely with the police department on the situation, and the marshal’s office was even there last night,” Barlow said. Anyone with information about the recent fires or has witnessed suspicious activity is asked to call the Colorado City Marshal’s Office at 928-554-8300. “We want the community to be aware and to know that they can call us if they see anything suspicious,” Barlow said.